Friday was homecoming night in downtown Nashville. 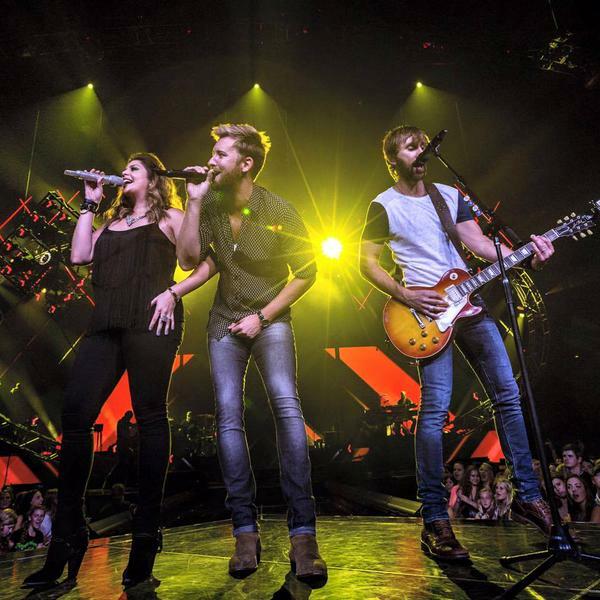 The fabulons gathered at Bridgestone that evening (Sept. 11) to greet Lady Antebellum at the group’s first Nashville arena show as headliners. It had been pouring rain earlier, but the skies cleared, just for us. “It feels good to be home; we’ve waited a long time for this,” said the group’s Hillary Scott. The occasion was the Music City stop on the group’s “Wheels Up 2015” tour. Its pre-show reception was staged at the “Pre-Flight V.I.P. Lounge,” a room off the AT&T Information Center, previously unknown to me. I love finding new places to party. The room was bedecked, floor to ceiling, in billowy white drapes. A small stage was backed by a glowing, pale-blue tour logo. Alas, the party space was too small for the number of people invited, so we sweltered in there. The trio took the stage and favored us with acoustic renditions of its hits, interspersed with Q&A with its fans. For the opening tunes, Lady A was joined by Hunter Hayes (on mandolin!). “We Own the Night” was followed by Hunter’s “Wanted,” embellished with Lady A vocal harmonies. “Give Hunter a big ol’ hand,” exclaimed Charles. “Give it up for Lady Antebellum,” responded Hunter. We did. Excerpts of “American Honey,” “I Run to You,” “Downtown” and “Need You Now” ensued. As usual, the trio’s performances became stellar whenever Dave Haywood added his elusive third-harmony voice. He also provided the acoustic-guitar accompaniment. “It’s my birthday,” said Charles. “I’m 34 years old: Life is just getting started.” The backstage fans sang “Happy Birthday,” and one of them gave him a wrapped birthday present. “Your life is going to change in a very few months,” Hillary told him. “It will never be the same.” Charles and his wife are expecting their first child. Band mates Hillary and Dave already have their first babies in the touring entourage. The Lady A Foundation funds are administered by Nashville’s Community Foundation. That organization’s Ellen Lehman was brought to the stage and presented with a jumbo check for $400,000. Fans held their devices high to capture all the party moments. The rest of us schmoozed. Charlie Cook, R.J. Curtis, Erika Wollam-Nichols, Amy Kurland, Bob Paxman, Ashley Gorley, Lori Badgett, Doug & Linda Edell Howard, Jay Frank, Karen Clark, Julie Boos, Eric Parker, Debbie Carroll, Diane Pearson, Lon Helton, Bobby Young, Chuck Dauphin, Chandra LaPlume, Tom Douglas, Tom Roland and fabulous hosts Donna Hughes and Royce Risser worked the room. Then Sam Hunt opened for Hunter Hayes and Lady A. This was many fans’ introduction to tunes from the group’s new 747 CD. Earlier in the day (9/11), the luckiest of the lucky went to RCA Studio A for a “secret” So There album-release party by Ben Folds. Only a few dozen were invited, but Lightning 100 did broadcast the hour-long show. Ben Folds performs at his secret show. 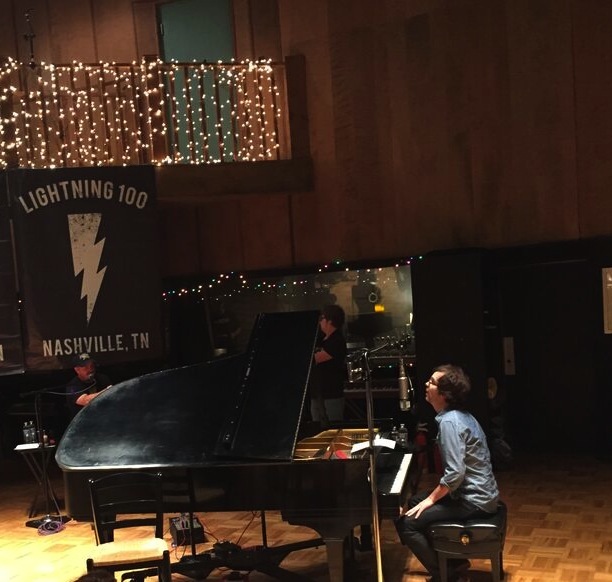 The Nashville-based piano popster celebrated his 49th birthday on Saturday, so he was another one serenaded by fans with “Happy Birthday.” Juli Thanki, Dave Paulson and Jae S. Lee documented the doings. Another homecoming, album release event was the sold-out Blue Sky Riders show at City Winery that night (Sept. 11). Well, it was a homecoming for two of trio’s members, anyway, Gary Burr and Georgia Middleman. Their partner Kenny Loggins remains West Coast based. What a team they are. Georgia’s effervescent showmanship, plus Gary’s angelic voice and witty repartee bolster Kenny’s star power for an outstanding combination. Their breath-taking song craftsmanship and awesome vocal harmonies complete the stunning package. The new, Nashville-recorded, self-produced CD is titled Why Not, and you could buy a “limited pre-release” copy of it at the gig. The trio favored us with “The Rodeo,” “Nothing Matters More Than Love,” “No Fool Like an Old Fool,” the audience-participation tune “I’m Lucky Like That” and other instantly catchy songs from it. During an acoustic segment, Kenny sang his evergreen “House at Pooh Corners” and “Danny’s Song.” Everyone sang along with both. Victoria Shaw, Bob Locknar and Rob Simbeck were among those applauding enthusiastically. I highly recommend City Winery’s chicken fricassee. The Lady A event was surprisingly foodless, so we were starved. Meanwhile, the late-night crowd was up on the Metro Courthouse lawn, boogie-ing in the dark with the rocking Passion Pit. Nashville’s own Turbo Fruits, Smooth Hound Smith, Colony House and The Vespers entertained earlier in the evening. This free, “Live on the Green” 2015 concert series concluded on Saturday with an afternoon and evening lineup including such Nashvillians as Lennon & Maisy, Mr. Steve, Steelism, Anderson East, Future Thieves, Elle King, All Them Witches and aforementioned headliner Ben Folds.